This article has new content coming soon from Halo Wars 2: Awakening the Nightmare, and may not be complete, confirmed or correct. Please update it as soon as any relevant and accurate material is available. The Abomination is a large and powerful Flood key mind war-form. A mobile key mind form below the level of a Proto-Gravemind, the Abomination is an evolution of the Juggernaut command form. The Abomination's role is to direct lesser Flood in combat, greatly increasing their effectiveness with its coordinating intelligence. Abominations are created when normal Flood hives cannot be formed and the Flood must remain mobile. As the Flood gathers strength, it will assemble attack waves of lesser Flood forms around Abominations for protection. The Abomination is the super unit for the Flood faction in Halo Wars 2's expansion Awakening the Nightmare. The Abomination has the ability to strengthen the Flood's firepower and defenses, allowing the packs surrounding the Abominations to become more durable and lethal to the enemies. It possess a powerful slam for attack, utilizing its tentacle arm to whip the ground, dealing considerate damage to infantry. It is best to eliminate Abominations quickly before the other Flood Forms rally around them. Abominations generally perform well against infantry, vehicles and structures, but cannot attack air units. The best unit to deal with Abominations is long-range units like the Kodiak, Blisterback, or any unit that can to dodge its attack. Super Units, such as Retriever Sentinels, Condors, and Scarabs are recommended to take an Abomination head on. The Abomination was introduced as the Flood super unit in Halo Wars 2's Awakening the Nightmare expansion. Its design is derived from the Flood Juggernaut, a Flood form that was originally created for Halo 2 but was ultimately cut from the game, though the Abomination is significantly larger than its forebear in-game. A form bearing heavy resemblance to the Abomination can be found in the cutscenes of Awakening the Nightmare, though acts in a different way. Where the in-game unit is slow and tank-like, the form seen in the cutscene is much more agile, rolling around in a ball and using its tendrils to grapple the limbs of Jiralhanae warriors and pin them down, as opposed to using them in a manner seen in-game. Renders of this unit from the cutscenes are referred to as the "Flood Commander" on Artstation, though it is unknown if this is intended to be a different Flood form entirely, or simply an internal codename for the model. Concept art of the Abomination for Halo Wars 2. Concept art of an Abomination attacking a member of Red Team. The Abomination in Terminus Firefight. 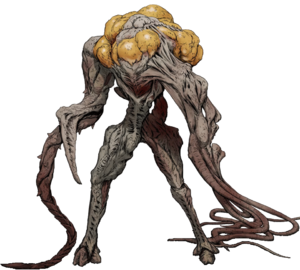 Render of an Abomination used in the Blur cutscenes, referred to as a "Commander".